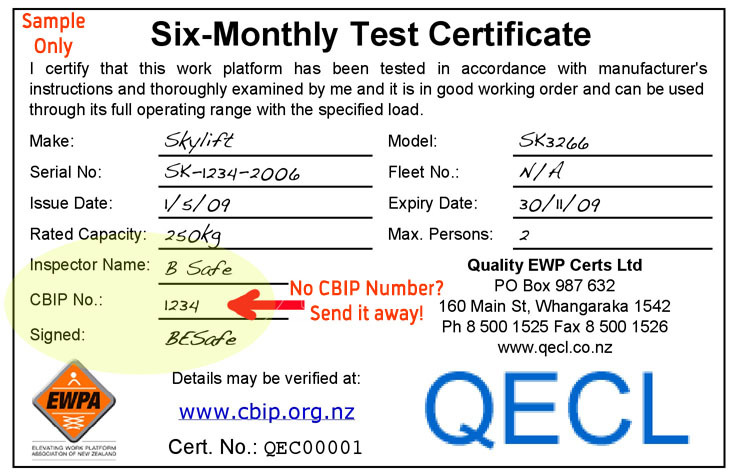 The Six-Monthly Test Certificate is a key element of EWP safety in New Zealand. This inspection checks that the equipment is in sound condition and that it is fully compliant with the requirements of the Best Practice Guidelines for EWP. To gain a Six Monthly Certificate the equipment must be acceptable for NZ use by complying with a recognised design standard, have been subject to required periodic maintenance and bear a Major Inspection Certificate if one is required. A Six Monthly Inspection entails testing an EWP through its full range of functions and, to perform such tests, the inspector must have access to the machine's manufacturer's workshop manual, in English. Inspector Name and Certification Board for Inspection Personnel (CBIP) number. CBIP credentials are the only evidence of competence in EWP inspection accepted by the Department of Labour. These credentials can be validated on the CBIP web site. Make, Model & Serial number should correspond with the Manufacturer's Plate and Major Inspection Plate (if applicable).